WHOLE FOODS: A WOLF IN SHEEP'S CLOTHING??? 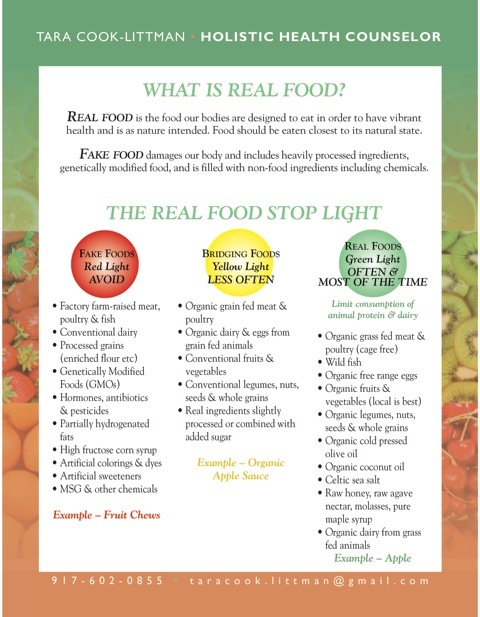 When most people think of Whole Foods the words that come to mind are - organic, sustainable, local, fresh, and quality. Well, I have some other words to add to that list; hypocrite, schizophrenic, and identity crisis. Whole Foods has created a niche in the market for themselves as the go to store for individuals seeking healthier, more sustainable, and local foods. Health food fanatics, moms, and environmentalists alike, all flock to Whole Foods for their grocery needs. But, is Whole Foods living up to their potential and their reputation? Absolutely not. I frequent my local Whole Foods and actually shed tears of happiness the first time I walked through their doors at the opening this past summer. You can certainly find an abundance of organic, sustainably grown, local food. The staff at the Fairfield Whole Foods is kind, helpful, and, for the most part, very knowledgeable. Whole Foods gives back to our community by donating food to the homeless shelter / social service agency, Operation Hope, where I sit on the board. In addition, Whole Foods has supported the movement for healthier foods in the Fairfield school system and has held events and promoted initiatives to support this effort. So, let's give credit where credit is due. With all those kind words above, you may be wondering, what's my beef with Whole Foods? Well, it will come as no surprise that my frustration with Whole Foods evolves out of their policy toward Genetically Modified Organisms (GMOs). While Whole Foods claims that their store brand, 365, does not contain GMOs and they have even gotten many of their products verified as Non GMO through the Non GMO Project, Whole Foods has not taken a strong position on GMOs to say the least. Products with GMOs can still be found throughout their store. Their already prepared food items contain GMO corn, soy, and vegetable oils. Whole Food's own policy on GMOs states, "Clearly labeled products enable shoppers who want to avoid foods made with GMOs to do so". http://www.wholefoodsmarket.com/values/genetically-engineered.php I ask you Whole Foods, if this is your policy, why are you not advocating for GMO labeling in CT and other states who are trying to clearly label packaging??? When I approached the local Whole Foods to do a GMO education event with me back in March, despite the local store being in favor of the idea, corporate Whole Foods struck down the idea and told the local Whole Foods employees to hold off on ANY non GMO education at this time. Really? No GMO educational events at the most critical time CT has ever seen in the fight to give consumers the right to know what is in their food? This position is simply unacceptable. Forget the fact that Whole Foods could probably do away with GMOs altogether in the American food supply by taking a stand and refusing to allow GMOs in their stores, but I would think it would be in Whole Food's best interest to support a bill that would give their consumers the transparency that they expect when shopping at Whole Foods. We deserve the right to know what is in our food. The citizens of fifty other countries, including all of Europe, Japan, China, Brazil, Australia and New Zealand all already enjoy this right because of mandatory GMO labeling laws. The CT GMO labeling bill is running out of time. If it is not called for a vote before May 9th, the bill will die a fast death. Call the corporate Whole Foods regional offices in NJ and tell them to speak out publicly in favor of CT HB 5117, 201-567-2090. Tell Whole Foods to live up to their reputation with the public and be a leader in our right to know what is in our food. Currently there is a bill in front of the Connecticut legislature that would mandate GMO labeling. This bill would give us the transparency that citizens of 50 other states, including all of Europe, Japan, Brazil, China, Australia, and New Zealand already enjoy. We want the right to know what foods contain GMOs so that we may have the ability to choose whether or not to feed GMOs to our families. GMOs are in 80% -90% of all the processed foods in America, yet most Americans have no idea when they are eating GMOs because of the lack of labeling. If you are eating processed food with derivatives of soy, corn, canola, cottonseed, or sugar beets, and that food has not been certified organic or verified as Non GMO by the Non GMO Project, then you are consuming GMOs. Through several animal studies GMOs have been linked with the following health problems: allergies, gastrointestinal disease, pre cancerous cell growth, infertility, changes in major organs, and accelerated signs of aging. The American Academy of Environmental Medicine urges physicians to advise their patients to eat a GMO free diet. If CT HB 5117, the mandatory GMO labeling bill, is not called for a vote before May 9th, the bill will die. Righttoknowct.org needs YOUR help to get this bill passed. Regardless of what state you live in, HB 5117 will affect you! If CT can lead the way for GMO labeling legislation, other states will follow. If this bill is defeated, it will deter other states from attempting to pass similar legislation and the Biotech industry will have yet another victory. BELOW ARE ACTION STEPS YOU CAN TAKE TO SUPPORT THE CT GMO LABELING BILL. TIME IS RUNNING OUT. RIGHTTOKNOWCT.ORG NEEDS YOUR HELP NOW. Tell your legislators to vote in favor of CT HB 5117, a mandatory GMO labeling bill. Go to www.righttoknowct.org to send letters to CT legislators asking them to support the bill. Click on the link and it will only take minutes. Governor Shumlin of Vermont has already succumbed to the pressures of Monsanto and is refusing to support Vermont's GMO labeling bill, we CAN NOT allow this to happen in CT. E-mail and call Governor Malloy in CT and tell him to support our right to know and support CT HB 5117. Tell Governor Malloy that CT is not alone, the country stands behind Connecticut's efforts to mandate GMO labeling. Below you will find a passionate, heartfelt, brilliantly written essay by my good friend Beth Beisel. On February 22nd I showed up in Hartford to offer testimony in support of the GMO labeling bill. This being the first time I ever testified at something like this, naturally, I was a little nervous. But, I had the universe on my side that day because standing right in front of me was Beth, who immediately calmed my nerves with her kindness and positive energy. We introduced ourselves to each other and I immediately felt a connection. Clearly synchronicity at work, Beth and I knew we would be working together going forward. Two weeks ago Beth and I did a successful talk at the Farmington Library. After Beth read my vacation blog a couple of days ago, she was reminded about this essay she wrote when reflecting about her dinner out with her son. I asked her if I could share it with all of you because it is a very powerful piece. Enjoy! A registered dietitian/ non-GMO activist/ loving mother describes a dinner out, with her son. Well, life has been busy and hectic, but he did have a point and I did have guilt. It seemed like tonight would be perfect; just my 10 year old son and me. My two daughters and husband were away for the weekend. I called a new hibachi restaurant in town to make reservations. I asked the manager if I could bring my own oils, because we avoid soy. His response was “we don’t use soy oil, we use vegetable oil”… (mix of genetically modified oils: soy, corn, canola, cottonseed – but most of you already know that). Anyway, he said they would accommodate my own condiments. We went in and sat down. There was another couple sitting at our grill. The woman’s eyes widened and she said, “you bring your own condiments?” I tried to play it down for my son’s sake, but wanted to answer her the way I usually do – with a passionate explanation about genetically modified poisons, etc. Instead, I told her the olive oil I brought was not extra virgin, and the flavor was so mild it shouldn’t change the flavor of the food too much; in case she got some of ours mixed in on the grill. Luckily she was accommodating. My son looked a little sad, and asked me if we could just this once eat the regular stuff like everyone else. (I guess last night’s dinner discussion about the GMO-fed rat’s testicals, that were shriveled up like raisins, didn’t have as much of an impact as I had intended.) I told him someday he would look back and be proud that he had a mother who had convictions and was an activist fighting protect the health of her family and friends. “Are you ok mom”? I told him I was fine, just saying grace. Once the exciting part, the grilling/show got started, I tried to relax for his sake. (The sake the chef squirted into my mouth helped, and so did the fact that we caught the chopped pieces of (?GMO?) zucchini he tossed into our mouths.) I wondered about all the spicy sauces he put on everything, and hoped the ginger and garlic would somehow offset the harmful effects of the other stuff we were eating. The rest of the night went well. We paid and went home. He still lets me cuddle with him before bed. I try to take advantage of it, knowing it will end all too soon. I uttered more prayers, asking God to protect my family from evil people like our current “food safety” czar, and held him until he went to sleep. I left his room and sighed, knowing that tomorrow and tomorrow and tomorrow he would be at some friend’s house or a school function, and some kind, unknowing person would share something with him – something that I would never let into my house. I sighed again, knowing that all I can do is my best; that the rest is out of my control. Then I took a deep breath and turned on my computer to the webinar I had missed – the one IRT is promoting on becoming a non-GMO speaker. This is a fight I will not lose. If my suitcases were searched by TSA agents on my way to Mexico last week, they would have been quite puzzled when they came across my suitcase filled with bags upon bags of Organic, Non-GMO Project Verified Tortilla Chips. Well, they were either confused or they questioned the sanity of a person who would schlep tortilla chips from the United States into Mexico, the mother ship for tortilla chips. That's right, I actually brought my own tortilla chips to Mexico. I will be the first to admit this may have been a little extreme. I had every intention of making sure my family did not touch a GMO tortilla chip the entire time we were there. However, when it came to preventing my children, my husband, my sisters, my brother-in-law, and my parents from eating those homemade chips that arrived warm at our table at each and every meal, I realized my intentions were not at all realistic. Despite being tempted, I personally stuck to my bagged chips and did not touch a homemade chip the whole week, but, when it came to my family I had to take a deep cleansing breath and just let go. I share this story to illustrate the point that when you are on vacation sometimes you just have to let go and be a little flexible . . . when in Rome. Stressing about food and trying to eat healthy while you are supposed to be relaxing and decompressing from the stressors in your life would be completely counterproductive and harmful to your overall wellness. However, with that said, it does not mean you need to completely throw caution to the wind. Below I have shared some tips on how to make the best choices when on vacation while still being able to enjoy yourself. Remember eating should be fun! Whether traveling by car, railroad or plane, food and snack options are almost always highly processed, tasteless, fake, and will make you feel terrible. Have you noticed how awful the food in airports or at the mini marts on the side of the road are? Pack some easy to carry snack foods with you so you are not caught unprepared and starving. Nuts, seeds, apples, bananas, popcorn, pure bars, lara bars, cut up vegetables like peppers and carrots, dehydrated fruit, crispy kale, Mary's Gone Crackers, chia seed bars by Health Warrior, and avocados (bring a plastic knife and spoon, cut open and enjoy) all make great options. Always fill yourself up on salads and vegetables. Be sure to start your meal with a salad and order extra veggies with your entree. If possible, request a refrigerator in your room. That way you can easily keep some fresh fruit, yogurt, and other items around for breakfast and snacks. If you have children, fresh cut fruit in the morning or afternoon is a perfect way to keep them happy. While traveling, breakfast can be one of the most challenging meals of the day. I always bring some Sun Warrior protein powder with me and then buy some rice milk to leave in my refrigerator. That makes for a great breakfast or afternoon pick me up. If you are like me, you will enjoy your vacation more if you keep up the exercise routine. At a minimum, you should take a nice walk every day. It will help you take in the sights and also burn up some of those extra calories you might be ingesting. Have you ever noticed that your bathroom habits change when you go away? You have to keep that digestion and elimination working. Make sure you eat plenty of food with fiber. Vegetables, flax seeds, and chia seeds are all great options. I always bring chia seeds with me and drink them in rice milk or water. Eat plenty of fruit, our body's natural cleansers. Also, drink a lot of water. Also, a very helpful tool is "Smoothe Move" tea, a senna based tea that you can buy at Whole Foods and other health food stores like Mrs. Greens. Another great tip is to bring some magnesium supplements with you, it keeps things soft if you know what I mean. Magnesium is a great supplement in general because it relaxes your muscles. Deprivation is not my thing, especially on vacation. Be sure you treat yourself and indulge a little, but go in with a plan that works for you. Maybe you allow yourself one treat a day or maybe you have a "treat day" where you let go a little more. I tend to stay fairly controlled until the last day when I reward myself a little knowing I have limited time which can minimize the damage! When dining out on vacation, or at home for that matter, don't be afraid to ask the chef to reduce or eliminate the use of butter, oil, and salt. If there is a piece of fish on the menu but it is smothered with a sauce, you can always ask to keep the sauce on the side or hold the sauce altogether and opt for a plain piece of grilled fish instead. Substitute less healthful options with better ones, for instance, swap out the french fries for rice, baked potato or extra veggies. Make sure you drink plenty of water especially in those hot climates. Water will keep you hydrated, feeling full, prevent water retention, and help your movements stay regular. Most importantly, enjoy your food and your meal times. Savor every bite of your food, cherish the people you are with, and take in the scenery! Five years ago, I had never heard of quinoa (pronounced Keenwah), but today I eat quinoa at least once a week. I would imagine you have all heard of quinoa by now, even if you haven't eaten it quite yet. While quinoa may be new to our plates, the Incas began eating quinoa as their staple food over 5000 years ago in South America. The Incas called it "the mother of all grains". Quinoa is widely considered to be a whole grain, but it is actually a seed from a plant related to the weed, goosefoot. Quinoa is now called a superfood by many because it is high in antioxidants, phytonutrients, fiber, protein, vitamins, minerals, and enzymes. (1) Quinoa is high in vitamins and minerals and blows the competition (corn, potatoes, wheat, and rice) out of the water with nutritional benefits. Quinoa is chock-full of micro-nutrients. It is a good source of manganese, copper, calcium, phosphorus, magnesium, potassium, iron, copper and zinc. (2) Quinoa is a complete protein containing all 9 essential amino acids required by the body to build muscle. Essential amino acids are those that our body can not produce on our own so we need to get them from our food. 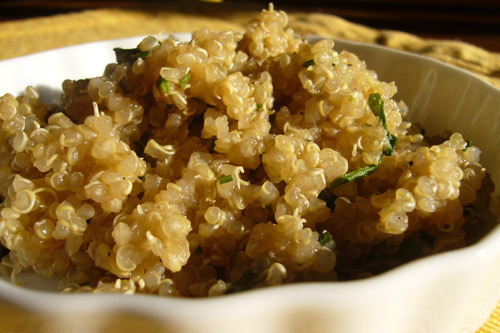 (3) Quinoa is a great source of fiber to keep that digestion operating and moving well. (4) Quinoa is gluten free and so it is a great option for anyone with gluten intolerance or celiac disease. Truth be told, everyone should have less gluten in their diet. (5) Quinoa is easily digestible. (6) Quinoa may be an effective way to use food as your medicine when preventing and treating certain diseases such as diabetes, insulin resistance, and some forms of cancer. I hear people say all the time that they don't know how to cook quinoa. Well, I am here to tell you that if you know how to cook rice, pasta, or cous cous, then you know how to cook quinoa. The general rule is 1 cup of uncooked quinoa to 2 cups of liquid (either water or vegetable stock). One way to boost the nutritional value of quinoa and to make it even more digestible is to soak and sprout your quinoa before cooking it. What I usually do is soak my quinoa overnight in water. Then, in the morning, I drain the quinoa, rinse and put it back in the bowl and let it sit on the counter in the sun until the evening when I am ready to cook it. If you let it sit long enough you will actually see little sprouts popping out of the seeds. Many people don't even cook sprouted quinoa and instead eat it raw. One of the best parts of quinoa is that it's flavor is very mild, so it will taste good with anything. My kids' favorite way to eat quinoa is with tomato sauce and parmesan cheese as if it was pasta. Here are some of my favorite quinoa recipes. Enjoy! Boil 4 cups of water and add the quinoa. Bring to a simmer and cook for 20 minutes or until water is absorbed. While the quinoa is cooking, remove leaves of kale from stem and rip into tiny pieces. It is very important that the kale is torn into bite sized pieces and massaged, otherwise the raw kale can be difficult to chew. Put the kale at the bottom of a bowl and pour the hot quinoa directly onto the kale which will slightly wilt the kale. Add the cranberries and sunflower seeds and mix together. Combine the juice of two oranges, the juice of 1 lemon, 2 tablespoons of honey, the olive oil and the apple cider vinegar. Mix together and pour over the quinoa. Preheat the oven to 425. Boil 4 cups of water and add the quinoa, reduce to a simmer and cover for ten minutes. Place the cooked quinoa in a bowl. Chop up the basil and put it aside. Chop all the vegetables and place in a baking dish. Toss lightly with the grapeseed oil and place in the oven until the vegetables are softened but not overcooked, approximately 20 minutes. Combine quinoa, vegetables, balsamic vinegar and olive oil. Top with chopped basil. Boil 4 cups of water and add the quinoa, reduce to a summer and cover for ten minutes. Place cooked quinoa in a bowl. Place spinach, basil, sunflower seeds, olive oil, garlic, and parmesan cheese in a cuisinart until you get a smooth consistency. Toss pesto sauce with quinoa. Chop the roasted red peppers and pour on top of the quinoa. This dish is delicious hot or cold and a vert welcome addition to any summer BBQ as a side dish.